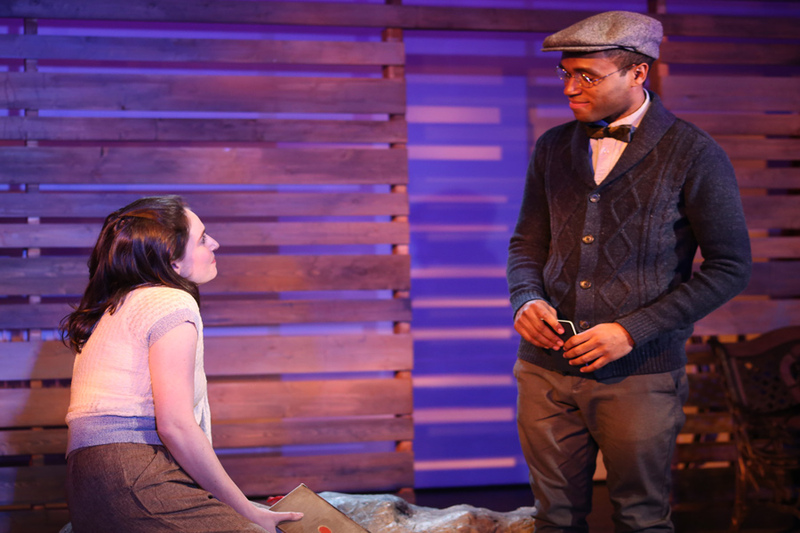 Jelani Pitcher and Rachel Shapiro in “A Home on the Lake.” The play, written by Evanston residents Stephen Fedo and Tim Rhoze, discusses race and housing discrimination in Evanston. The play “A Home on the Lake,” written by Stephen Fedo and Tim Rhoze, struck close to home for Evanston residents. Characters in the play referenced the familiar “special sauce” at Hecky’s Barbecue and the quintessential North Shore dream of owning a home on the lake. But the play tells a grave side of Evanston’s history as well — one of discriminatory housing practices and segregation. The play, running from April 19 through May 20 at the Piven Theater, 927 Noyes St., is a collaboration between the Piven Theatre Workshop and Fleetwood-Jourdain. The show was sold out during opening weekend. With an ensemble of six actors, the play features an LGBTQ, biracial family in the present and two families, one white and one black, in the 1920s. The show follows the families as they are all impacted by the changing housing market and discrimination in Evanston. Rhoze said he and Fedo chose to intertwine stories from the past and the present to illustrate that past actions continue to affect life in Evanston today. Though he emphasized that the characters themselves are fictional, Rhoze said historical housing discrimination in Evanston was real. In the process, Rhoze said he used interviews from Nina Kavin, co-founder of Dear Evanston, as inspiration and research for the script. He said he had heard stories of black-owned homes by the lake being loaded onto flatbeds and driven to the west side of Evanston, referenced in one of the opening scenes of the play. In her work for Dear Evanston — a Facebook page discussing race and inequality in the city — Kavin said she has focused on discussions of violence. Over the years, she said she began developing relationships with Evanston residents, particularly those in the black community. Kavin said she interviewed Evanston residents on her own, but Piven Theatre contacted her to collaborate. She said her interviews provided “flavor and texture” for the playwrights. Kavin discussed the systematic efforts to keep black people from living on the lakefront. As black people moved to Evanston from the south, she said they often had no choice but to live in the 5th Ward due to housing costs and discrimination elsewhere. Still, she said white people needed black people to work in Evanston and live nearby to support the economy. However, Kavin said a dominant theme in her interviews was the idea that black people living in the 5th Ward created a self-sufficient and cohesive community despite facing racism and discrimination. Still, she said the community lost a lot of black institutions due to desegregation. Kavin interviewed 5th Ward resident Jerome Summers, former Evanston/Skokie School District 65 board member, for the project. Summers’ family has lived in Evanston since the 1890s, he told Kavin. Though the people Kavin interviewed are not portrayed as characters in the play, she urged people to watch the interviews on the Dear Evanston website because she said very few white people from Evanston are aware of the “richness” of these stories. Kavin described the resilience, love and community in the 5th Ward despite massive barriers and challenges. Rodney Greene, former Evanston city clerk, attended the play on Sunday and said it provided insight into the history of the city and how white people took land on the lakefront from the black community. At one point in the city’s history, he said, black people were not even allowed to swim in the lake in Evanston, another fact addressed in the play. Greene said even though Evanston has come a long way since then, housing is still difficult to afford. Rhoze said people should come to the show with an open mind and prepare to be entertained and learn something about Evanston. He also said he hopes the show will lead to conversations about race in the city. Rhoze said he was happy to collaborate with Piven on a project addressing such important themes as home, history and family. This story was updated to clarify that Tim Rhoze was referring to historical housing discrimination in his statements about intertwining stories from the past and present.